We’ve added three new “information intensive” posters from Feennix. These popular posters are laminated for durability, and contain large amounts of excellent pictures, insets, and most of all INFORMATION. We’ve had great success with this line and so we decided it was time to expand it! First new poster is the Human Evolution poster. 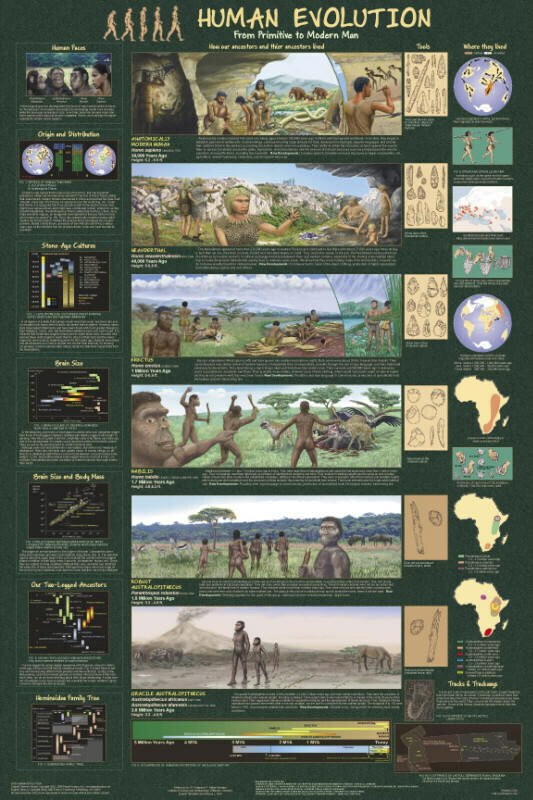 Much like the popular Eras of Life poster this poster covers several eras and species that make up our ancestors. The chart starts with Australopithecus africanus and works its way up to Homo sapiens of 30,000 years ago. Insets cover migration, society, relationships, and much more! This poster is a must for anyone studying human evolution. Next up is a popular subject, even among dinosaurs, the Tyrannosaurus poster. 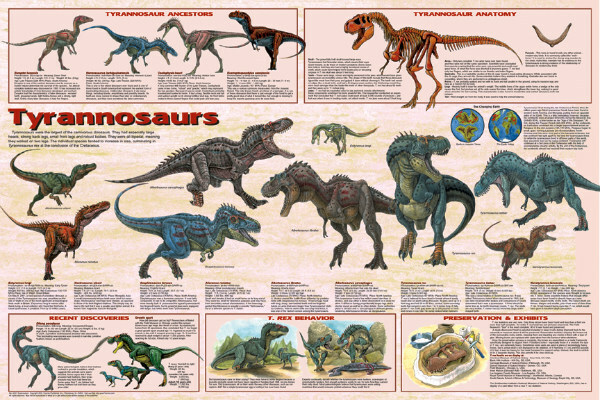 In this poster the center portion shows all nine members of the Tyrannosaur family, with T.Rex taking center stage. Insets cover recent discoveries, behavior, ancestors, and anatomy! This poster is a must for any dinosaur fan! This chart is full of information that will help the reader identify insects by their physical characteristics. 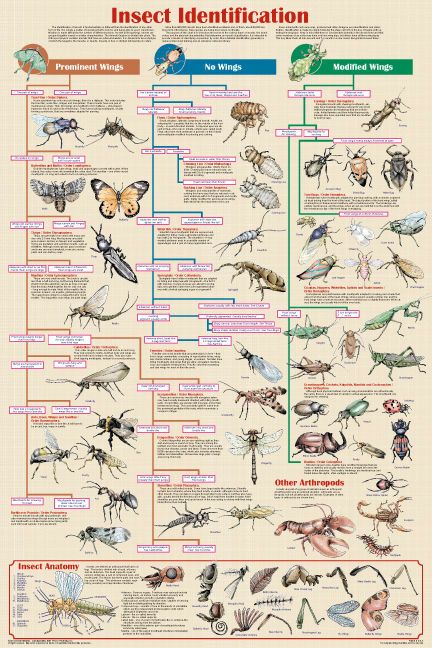 The chart is detailed enough to identify the order from which any insect comes! This poster is popular with students, collectors, and schools. Recent streamlining of the design has made it even easier to use. These posters are great new additions to our product line. If you’ve ever enjoyed any of the “information intensive” posters we carry these will be great additions! Two Great Offers On Lab Equipment! So we have two great offers from two of our excellent suppliers of Lab Equipment. First up is an offer from BenchMark for their Hybex Bottles. Free BenchMixer when you Buy 5 Packs of Hybex Bottles! Free MyFuge with order of 10 Packs of Hybex Bottles! Hybex Bottles are durable and have low coefficients of thermal expansion (3.3) that can withstand temperatures from -70 to 500° C. Hybex bottles have a drip-free sealing ring in the cap and are available in different sizes: 50ml, 100ml, 250ml, 500ml, 1000ml, 2000ml as well as a mixed pack of different sizes! You can get different colored caps when you order (standard is blue) as well as High Temperature Caps. This BenchMark offer is good through May 31st, 2011. Order one of these and get a FREE SRP 4 x 50ml Rotor! That’s a $300 value! FREE with purchase of Champion S50D Centrifuge! This offer from Ample Scientific lasts until June 30th, 2011. Be sure to take advantage of these deals! Zube Tubes are a sound-making toy that has been around for a couple of decades! Or rather they would have been except that…they went away. Its not certain what happened to make the Zube Tube go away – they were certainly popular enough and available in lots of places, but they did. So for a few years kids and adults could not get a nifty new Zube Tube. But now they are back! The design of the Zube Tube is simple: A spring is stretched inside a tube with plastic caps at the ends that help the noise. When you shake the Zube Tube, strum the spring, or speak into it the spring makes a bizarre space-wars sound that most folks should recognize from the movies. Shaking it in different ways, speaking in different tones, and strumming the spring in different ways changes the sound in small ways so almost always get a different sound! You can’t really describe sound by typing, so we made a video of the Zube Tube in action! The Zube Tube – if nothing else it will confuse the Postman or UPS guy when one is delivered to your house! Often mentioned on forensic-based TV cop-shows, but rarely actually shown , Comparison Microscopes are excellent tools not just for forensic work, but also for comparing different tissue types, teaching, and for checking diseased vs. healthy tissues. They are used to compare the samples on two slides side-by-side. They look clunky, because they essentially are just two microscope bodies attached a the top by an optical bridge. The mechanics are 2 high quality binocular microscopes which combine 4 DIN objectives (or 5 in the advanced model), a large stage, a mechanical stage, coarse & fine focus, and N.A. 1.25 Abbe Condensers among many other features. To do a comparison of slides, you place 1 slide on each stage, bring them to focus, and make adjustments on the optical bridge. Comparisons can be made with almost anything that can be put on a slide. Comparison Microscopes are invaluable in teaching students to see diseased tissues vs. healthy, forensic work, and a host of other fields. Want to buy a standard Comparison Microscope? 50 years ago today Yuri Gagarin became the first man in space. Until that time, only unmanned satellites and experimental animals had been sent up into space. It was a major coup in the Space Race for the USSR. Less than 1 month later, the USA sent up Alan Shepard , although his flight was suborbital. There were other differences in the two flights as well: Shepard had some control over his flight, wheras Gagarin’s was completely automated. Shepard also splashed down in the Ocean wheras Gagarin bailed out of his Vostok 1. This detail was kept quiet by the USSR since the required standard for a successful spaceflight was that the craft would land on its own. Although this was a ‘violation’ of the Spaceflight standards of the time, only a few people have since made much of an issue of it and Yuri is generally considered the first man in a successful spaceflight. Unlike Shepard, Gagarin also never returned to space, and he died in a plane accident in 1968. In the years since the Soviet Union collapsed, rumors have surfaced that other Cosmonauts were sent into space before Gagarin but did not survive – their failure being hushed up by the tight-lipped Soviet Union. The facts are that such dead cosmonauts were either fictional, died on Earth, or were dismissed for misbehavior. So here’s to 50th years of Manned (if automated) Spaceflight! We carried them last year for Spring and Summer so we brought them back for this year’s warm season. Its the EcoAquarium frogs! Sadly, these are sold in-store only. Shipping them is too much trouble. But for those of you local to the store you can come in and get your own little aquarium with frogs! These are very low maintenance pets. In fact we think the only pet that requires less maintenance are the Ecospheres. The frogs need feeding only twice a week, and their tanks only need to be cleaned twice a year! You can’t beat that! The frogs are African Aquatic Dwarf Frogs, a species that prefers to remain underwater inhabiting a very small area. As a result the frogs are very comfortable in the small EcoAquariums. They live 2-3 years if cared for, and care is very easy. You can’t take the frogs out to play with them – they are too fragile. But while they might lounge around a lot they do cavort and swim around. The trick to the EcoAquarium is the living gravel that comes on the bottom. If helps to ‘scrub’ the tank of waste products. The colorful gravel on top gives it a nice look and the high-protein/low waste food you feed them helps keep the tank clean. The EcoAquarium should be kept in indirect light – direct sunlight should be avoided as it encourages algae growth. Frogs are in stock in the store. You can also pick up a food pack (1 years supply), a total care pack (includes food and gear for making water changes) as well as a decorative base. Come on down and get some frogs if you can!